The 1H-nuclear magnetic resonance spectrum showed that the l-rhamnosyl residues of native gellan gum were coinvolved in both a small number of 4C1-pyranose conformations and a large number of 1C4-pyranose conformations, whereas for deacylated polymer, almost of the residues were involved in 4C1-pyranose conformation. The flow curves of native gellan gum showed plastic behavior above 0.2%. The elastic modulus stayed at a constant value with increase in temperature up to 40 °C, then decreased rapidly. The elastic modulus increased with addition of CaCl2 (6.8 mM) and stayed constant value with increase in temperature up to 65 °C, then decreased rapidly. 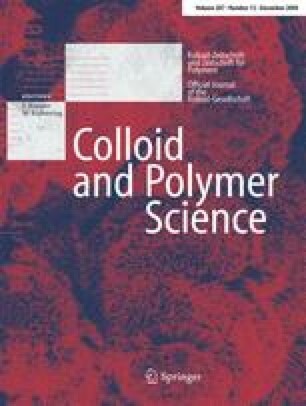 The stronger elastic modulus was observed in deacylated gellan gum with addition of CaCl2. The elastic modulus of native gellan gum showed larger value than that in aqueous solution in the presence of urea (4.0 M). Intra- and intermolecular associations of native gellan gum molecules in the presence of Ca+2 were proposed. Paper presented at the 23rd International Carbohydrate Symposium, 23–28 July 2006, Whistler, Canada. The authors thank Dr. T. A. Talashek, CP-Kelco, California, U.S.A. for providing the native and deacylated gellan gum.